Contact AACT member services to request sponsorship card(s). Each card costs $50, which fully covers the cost of membership for the lucky recipient. You can request as many as you like. Please note that at this time, sponsored membership cards can be redeemed for teacher members only. Give your card(s) to a teacher or to an administrator at a local school to support a teacher you haven’t met. 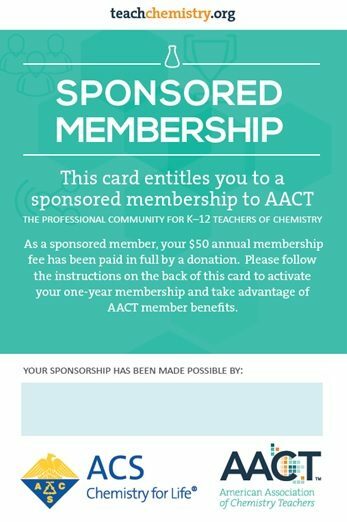 Because the cards contain a special code the teacher references when he or she joins AACT, you aren’t limited to sponsoring only teachers you know personally. Don’t forget to sign your cards so that your sponsored teacher knows who to thank! Congratulations, you just strengthened the AACT community. And because it was so easy, maybe you want to do it again? Lucky you! When you receive a Sponsored Membership card, please call AACT member services to join at no cost. As an AACT member, you’ll have access to the full suite of member benefits, including member-only online content, a subscription to ChemMatters, professional development opportunities, and more!